You carefully researched your oak flooring purchase; you selected the right type for you from solid oak flooring and engineered oak flooring and you chose the style and finish that best complemented your own taste. You might have chosen a Celtic Character Rustic for your home, or perhaps an unfinished finish was your choice, so that you could decide how you wanted to finish your floor to your taste once it had been installed. Now that your oak flooring is installed, you want to make sure that it looks the very best that it can for as long as possible. We have put together nine ways to help make your floor shine. 1. You did your research before having your floor installed and when you are preparing to do anything to your floor to maintain it or clean it or change/ improve its appearance, it is important that you make sure that you have done the right preparation first. DIY Doctor highlight the importance of knowing exactly what type of wood flooring you have installed and what type of seal and finish it has, so that you can select the best products for the job that you are looking to do. By doing the right preparation, you are already one step closer to making your oak floor shine. 2. Make sure that you make your floor as clean and free from spillages and build up as you can before you put any treatments on it or undertake any cleaning activities. As Apartment Therapy note, moisture and dirt are the main things that you want to be aware of and pro-active against on a continual basis and by doing this, you make it easier to clean and maintain your oak flooring and have that shine for longer. Apartment Therapy suggests using entry rugs and leaving your shoes at the door to minimise dust and dirt across the floor. 3. If your wood flooring is sealed or if it is not sealed, you can use wax to bring your oak flooring to a shine. DIY Doctor has detailed advice on how best to apply wax to your floor; if your floor is not sealed, you are best applying a solvent-based wax that is rubbed into the grain and then buffed with an electric polisher. DIY Doctor also has a handy resource available for which tools are best suited to your job. Using wax to make your oak flooring shine will have the added benefit of extending the life of a sealed floor by a great deal. If you have a sealed floor, the wax should be applied and buffed to a shine regularly but it is important that it is also removed from time to time with a detergent (neutral) to avoid a build-up on your flooring. 5. Cleaning your oak flooring before undertaking any waxing, polishing or re-finishing is very important and you need to use the right products. You don’t need to buy expensive cleaning products to prepare your oak floor, instead you can create your own solution by mixing a small amount of pH-neutral soap in a bucket of warm water and clean your floor using a cloth that isn’t dripping with the solution and then rinse with plain water. We found this handy trick on Apartment Therapy in their “Homekeeping 101: Cleaning Your Hardwood Floor” post, you will find some more great tips and advice for cleaning your flooring there (including our next trick!). 6. Tannic acid in tea is great for creating a shine for hardwood flooring. Boil two tea bags and pour the boiling water into a bucket after allowing the tea bags to steep for several minutes. Take a soft cloth, wring it out in the tea and rub the damp cloth over the flooring. 7. 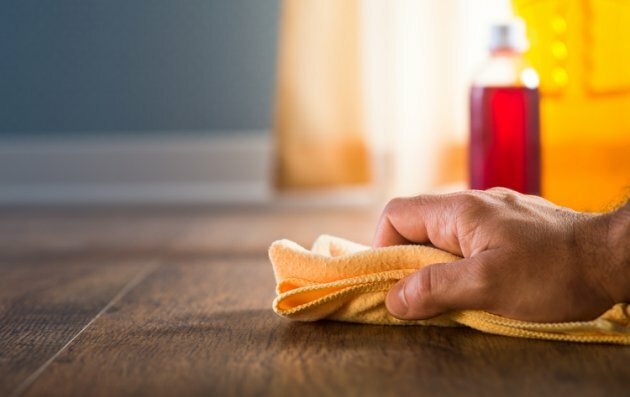 You want your wood floor to stay in its best condition for as long as possible; follow these tips to make sure that your maintenance and improvement efforts don’t go to waste: do not use the type of furniture spray that will leave a build-up that is slippery and waxy and do not use harsh cleaning solutions such as ammonia. What about between waxing/ polishing/ re-finishing? 8. When your flooring is between annual cleans/ waxes etc, Apartment Therapy has found a tip that recommends that by frequently dusting your floor using either a mop that has a specialist dusting agent treatment or disposable electrostatic cloths, you will be able to keep your oak flooring clean and shining in between big deep cleans. Whichever type of oak flooring that you have, whether it is solid or engineered, we understand how important it is to keep your floor looking its very best at all times. We have several guides available to help you understand the kind of care and maintenance that will benefit your floor the most and we also have an FAQ section that covers the most popular questions asked by our customers, which will help you to understand even more about your oak flooring and how it works. Will making my floors shine be bad for the environment? 9. Oak Floors Online have a full range of oils and lacquers available to order to help you to achieve that shine for your oak flooring and these products have been developed in line with our continuing commitment to protecting the environment. Our waxoil is formulated with natural vegetable oils and waxes and has been awarded the European Eco Label, along with our initial high build lacquer, so you can be confident that you are not only improving the quality of your oak flooring by making it shine, you are also a part of our commitment to protecting the environment.